“The great use of a life is to spend it for something that will outlast it.” – William James. Do you know how some women just know they are meant to be mothers? That wasn’t me. My husband, John, and I were having a great time being kid-free. We were traveling all over North America as manufacturer’s reps in the outdoor / ski industry. For pleasure, we’d travel to Mexico and South America to partake in high altitude climbing expeditions. 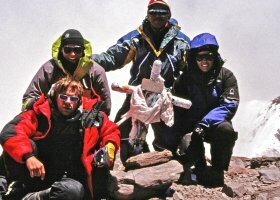 Our passion for climbing high culminated in the summit of Aconcogua, the highest mountain in the western hemisphere, in December of 2000. We sailed competitively, mountain biked intensely, and were avid enthusiasts for any sport that included a ski. At one point, I shocked my family by declaring outright that we wouldn’t be having children. There was just too much life to live, and kids weren’t in the picture, I explained. If we’d stuck to that plan, you wouldn’t be reading this blog right now, and three delicious babies wouldn’t have been brought into this world. As it turned out, fate didn’t give us a second chance to re-evaluate our decision and I was pregnant a month later. And that’s where our baby travel adventures started. Gracie was born, we had a business to run. So Gracie came with us to trade shows, sales meetings and account visits. We were very fortunate to have my mom & dad’s help when John and I needed to work at the same time. They flew all over the country to take care of our new little bundle of joy. A mere 18 months later, along came Callie. And 20 months after Callie, Christopher was born. In the span of 2 short years, we’d moved from our home in Michigan to California to Colorado and back to Michigan. There were plenty of trips around the U.S. and even trips to Europe and Mexico. We even had the opportunity to spend a brief span living in San Miguel de Allende, Mexico and Riva del Guarda, Italy. When I read excerpts from other traveling mothers, they all seem so “put-together”. My traveling style could be best summed up as the “fly-by-the-seat-of-your-pants” method. Many of my blog posts come from personal mistakes: When flying on an airplane, pack a light change clothes for parents in addition to babies… because you never know when your little one will throw up or spill the apple juice. If you only KNEW how many times I wished I’d heeded that bit of advice! God forbid any of my blog posts should sound preachy. Because if there is a mistake to be made, I’ve made it in over 100,000 miles of traveling with kids under 5 years of age. But this is something I can say with confidence. 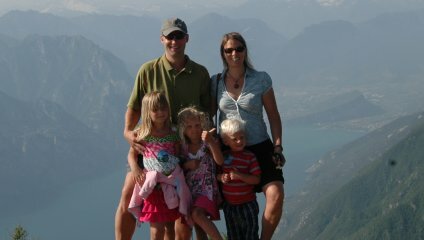 Our family is stronger – much stronger – than it ever would have been without those fabulous BabyTravel adventures. My husband and I consider travel to be the greatest character-building, relationship-strengthening experience you can bestow on your children. It’s not always easy, but it can always be fun if you choose to approach it with the right perspective. Whether this is your first trip with a baby or you are a seasoned BabyTravel professional, I hope you enjoy the information on this site and add your wisdom to these pages.